MainBlogsThe Tamar Yonah ShowFatah and Hamas - Is There REALLY a Difference? Well, if not peace, then at least a real hope for peace, as the Fatah and the Hamas have agreed to form a unity 'government'. (See news article: 'Fatah and the Hamas have agreed to form a unity 'government' .) But does it make a difference? IS there any difference between the Fatah (PLO) and the the Hamas? We are fed by the media and by the governments of the world pushing the 'peace process' that the fatah/PLO has changed, and now will work towards peace with israel, striving to live side by side with us. The Fatah and its leader Mahmood Abbas are supposed to be 'moderates'. They wear suits and ties. 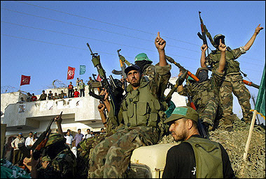 They were supposed to have changed their charter after the Oslo Accords, to stop their armed struggle. They never did this. They never revised their charter. Which is Fatah and which is the Hamas? Both are publicly parading with weapons they use (or plan to use) on Israel. See the Hamas Charter: (Here are just the first 12 resolutions, for brevity's sake) Pay attention to what is highlighted in red.